What is your favorito thing about Discord? Notes: My Little pónei, pônei is owned por Hasbro and created por Lauren Faust. This is a story that I wrote for both Fanfiction.net and Fanpop. I hope that you enjoy and comment. Discord was walking around Ponyville, resisting his temptation to pull pranks on the residents of Ponyville. A building was being made to protect animais that didn't have anywhere else to live. 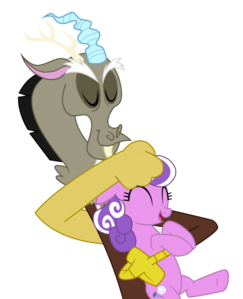 It was Fluttershy's idea so Discord pretended to care. Mr. Cake said "Hi. How can I help you?" Discord is a supporting character and former villain in the animated show My Little Pony: Friendship is Magic.